Jack Marriott scored the only goal of the game as Luton dented Plymouth's hopes of automatic promotion. He struck in the first half, finishing coolly at the near post after an excellent pass from Paddy McCourt. Luton goalkeeper Jonathan Mitchell was inspired, saving twice in a minute from Graham Carey as the Pilgrims piled forward in search of an equaliser. Hatters debutant Glen Rea then missed an easy chance before Mitchell tipped Gregg Wylde's shot onto a post late on. Plymouth's defeat enabled Bristol Rovers to climb above them into the top three on goal difference, while Luton moved up to 12th. Luton manager Nathan Jones told BBC Three Counties Radio: "To come away to a very, very difficult place and a side that's pushing for automatic promotion, and to put in the performance we did and get the result we did, I'm very pleased. "Today we felt that we handled everything they had, there was no clear cut chances for them. "It's a difficult place to come to but we're delighted with the performance and obviously delighted with the win." Match ends, Plymouth Argyle 0, Luton Town 1. 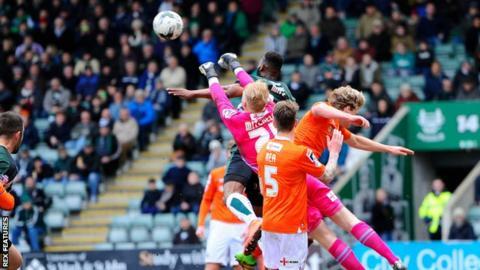 Second Half ends, Plymouth Argyle 0, Luton Town 1. Corner, Plymouth Argyle. Conceded by Cameron McGeehan. Attempt missed. Jake Jervis (Plymouth Argyle) header from the centre of the box is close, but misses to the left. Glen Rea (Luton Town) is shown the yellow card for a bad foul. Ben Purrington (Plymouth Argyle) is shown the yellow card for a bad foul. Glen Rea (Luton Town) wins a free kick in the attacking half. Foul by Ben Purrington (Plymouth Argyle). Substitution, Plymouth Argyle. Carl McHugh replaces Gregg Wylde. Attempt missed. Craig Tanner (Plymouth Argyle) left footed shot from outside the box is just a bit too high. Attempt missed. Jake Jervis (Plymouth Argyle) left footed shot from outside the box is just a bit too high. Corner, Luton Town. Conceded by Luke McCormick. Attempt saved. Jack Marriott (Luton Town) left footed shot from the left side of the box is saved in the top right corner. Cameron McGeehan (Luton Town) is shown the yellow card for a bad foul. Graham Carey (Plymouth Argyle) wins a free kick in the defensive half. Foul by Cameron McGeehan (Luton Town). Gary Sawyer (Plymouth Argyle) wins a free kick on the right wing. Foul by Paul Benson (Luton Town). Substitution, Plymouth Argyle. Reuben Reid replaces Jamille Matt. Substitution, Plymouth Argyle. Jake Jervis replaces Jordan Houghton. Attempt missed. Stephen O'Donnell (Luton Town) right footed shot from the centre of the box is close, but misses to the left. Attempt blocked. Craig Tanner (Plymouth Argyle) left footed shot from outside the box is blocked. Substitution, Luton Town. Magnus Okuonghae replaces Dan Potts because of an injury. Corner, Plymouth Argyle. Conceded by Dan Potts. Jonathan Smith (Luton Town) is shown the yellow card for a bad foul. Attempt blocked. Peter Hartley (Plymouth Argyle) left footed shot from outside the box is blocked. Oscar Threlkeld (Plymouth Argyle) wins a free kick in the attacking half. Foul by Jack Marriott (Luton Town). Attempt saved. Graham Carey (Plymouth Argyle) left footed shot from outside the box is saved in the centre of the goal. Corner, Plymouth Argyle. Conceded by Scott Cuthbert. Gregg Wylde (Plymouth Argyle) hits the left post with a left footed shot from the left side of the six yard box. Foul by Oscar Threlkeld (Plymouth Argyle). Dan Potts (Luton Town) wins a free kick on the right wing.